For the sake of space and repetitiveness, I'll be referring to BMO as male for this article. Lookin' good, BMO. Lookin' good. Upon booting up the app, you're greeted to a bios loading screen showcasing Cartoon Network's logo followed by a list of all of BMO's driver's loading. After the little guy boots up, you're welcomed by none other then BMO himself. 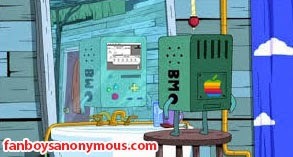 Taking up your screen is a front view of BMO as seen in Adventure Time. Tapping his face allows you to interact with the little guy, invoking an "Ouch" as well as a little "Grrrr!". Leaving him be just makes him bored, eventually he even falls asleep. From here, press the big red button to move on and gain access to games, a camera, ringtones, a soundboard, an alarm clock and the help menu. Press the red button to select a category, the green one to go back a directory and the blue triangle to go to the home screen. Of course, the directional arrows allow you to move through the menu and control the games that are built into the app. Skipping games for a sec and going to the soundboard, we find a variety of audio clips from the show. These clips are categorized by character. Among the characters to select and hear from are BMO, Finn, Jake, Ice King, Lumpy Space Princess, Princess Bubblegum and Marceline. These clips last only a few seconds at most, but represent the best of each character. Though, I did notice a lack of “BMO Chop” to listen to. Going to games, you start to see not everything is free. For $0.99 you can unlock Kompy's Kastle and Conversation Parade. Still, Pro Footbal 1861 is available from the start. What should be noted is that these games are similar to what has popped up in the show at some point, being played on BMO by none other than Finn and Jake. For 99 cents, you could do worse. Also, you get to unlock some music tracks. As those familiar with Adventure Time's musical score know, this isn't a bad thing. Pro Football stars a football-throwing Abe Lincoln in an Atari graphic, one-player game. Playing as Abe, you kick a football thrown at you by another Abe Lincoln back at the other Abe. If done right, you can hit the other Abe in the head like a sock-em-rock-em robot, his head actually bending backwards in an unrealistic fashion. The goal of the game is to return 999 throws. For a free app, as well as the 99 cent purchase, this is a pretty nifty tie-in to a great animated series. With the way merchandising tie-in games and apps have turned out over the years, you could do much worse. Great time waster, especially for kids.